The days of business push-back on environmental legislation are in the rearview mirror, at least for the food industry. So long, don't let the door hit you on the way out! 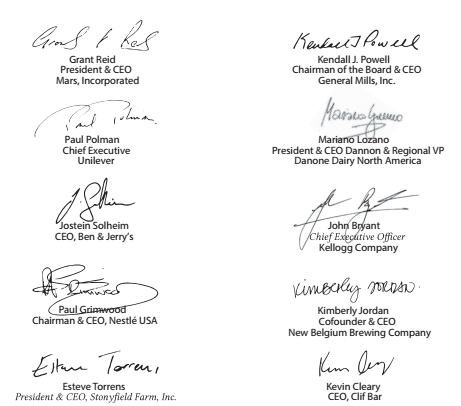 Yesterday 10 major food companies -- coordinated by Ceres and led by Mars -- released a letter to U.S. and global leaders calling for action on climate change. The signatories are a mix of major food conglomerates and mid-sized companies with a known sustainability bent: Mars, General Mills, Nestle USA, Unilever, Danone Dairy North America, Stonyfield Farm, Ben & Jerry's, Kellogg Company, New Belgium Brewery and Clif Bar. "Climate change is bad for farmers and for agriculture. Drought, flooding and hotter growing conditions threaten the world's food supply and contribute to food insecurity," the letter, which also ran in full page ads in the Washington Post and Financial times, states. Beyond calling for action in Paris, the letter includes three commitments: re-energize our companies' continued efforts to ensure that our supply chain becomes (sic) more sustainable, talk transparently about our efforts and share best practices, and use our voices to advocate for governments to set clear, achievable measurable, enforceable science-based targets for carbon emissions reductions. This last commitment -- to lobby for carbon targets -- is the most exciting of the bunch. These ten companies have holdings and work with suppliers all around the world and in districts all around the U.S.. By making their preference for a carbon target known to their legislators, they influence the political process and offer a path through the political minefield that supporting environmental legislation has become. "Modern life has put a great many of us into a private bubble of consumption. There is too much distance between us and the natural world, we are no longer dependent on nearby farms. So the signals of distress that the earth and atmosphere are sending are falling on deaf ears. It’s really important that the big agriculture and food companies that provide the bridge between natural world and our bubble understand the importance of action on climate change." He spoke to the courage the companies took in taking this position in favor of climate action. Parkin explained why Mars was taking a leadership position, "It's the right thing to do. We're doing this for our kids, grandkids and future generations. We're also doing it for the millions of farmers in our supply chain. Many are smallholders living on the edge. Many of us will get by [survive climate change], they may not." Tom Langan from Unilever echoed the business case, "Climate change impacts our business directly to the tune of three hundred million euros a year." He spoke passionately about the droughts occurring with greater frequency around the world, "Water is a major problem. Consumers need water to use our products." Deforestation is also a big concern and the company is tracking impacts in palm oil, soy, and deforestation around the world. "We want to be influential voice on climate change. But we need to work together. We can reach all our goals and it won’t make a difference. We need government support because we live in a carbon based economy. This is our message for Paris. We can’t change ourselves. We're calling for a responsible, meaningful carbon price." Mindy Lubber, CEO of Ceres, closed the session, stating, "The leaders sitting here today have helped to emphatically dispel notions that this [climate change action] is for liberals.... There isn’t a leader anywhere who wouldn’t jump in front of a truck to save children. Climate change is that truck." One hopes that as these ten companies take a stand, others will fall in step and that this pressure will build to make climate action more politically palatable. One way or the other, it is looking likely that the U.S. will sign on to some kind of commitment in Paris. Whether or not congress will be able to pass legislation to support it is another question entirely. It looks like they'll be at the table, even if they have to be dragged there kicking and screaming.